How to Love God Every Day! It was FALL 2012 — I was teaching a course at Columbia Int University entitled: Principles of the Christian Life: Ethics and Sanctification. Robertson McQuilkin created this course during his presidency and his book on ethics and his book on the Holy Spirit came out of class handouts used with several generations of students. I had the privilege of being one of those students in 1978. Now, 2012, I was asked to teach the course — a double honor. Robertson believed that ethics, what we should choose, and sanctification, walking in the power of the Spirit so we can choose well, needed to be together in one course. As far as I know CIU is the only school that frames the teaching of ethics in that way. I invited Robertson to come as a guest to share how he practiced his daily love time with God and to answer questions from the students at a halfway point in the course. This 13 minute video is lifted from that class. Enjoy — and think about your alone time with the Grand Lover of your soul. 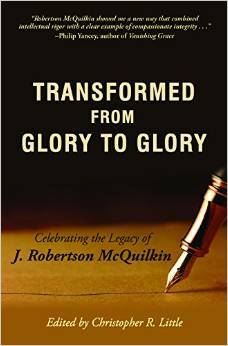 Here is the chapter I wrote for a book to honor Robertson McQuilkin, president emeritus of Columbia Intl University. It is a letter to my son, Mark, to offer encouragement and reminders for leadersthip in the 21st century that aligns with God’s heart. You may order the book from Amazon here! How Do We SEE the People We Lead? Ministry leaders cease to be LIFE GIVING when they see people as problems rather than as God sees them. Complaining and THANK FILLED, PRAISE SATURATED, FAITH SEEN PRAYERS do not mix together well. Notice how these leaders describe and pray for the people entrusted to them. Romans 16:19 ESV For your obedience is known to all, so that I rejoice over you, but I want you to be wise as to what is good and innocent as to what is evil. 2 Corinthians 7:4 ESV I am acting with great boldness toward you; I have great pride in you; I am filled with comfort. In all our affliction, I am overflowing with joy. Philippians 1:3-7 ESV I thank my God in all my remembrance of you, always in every prayer of mine for you all making my prayer with joy, because of your partnership in the gospel from the first day until now. And I am sure of this, that he who began a good work in you will bring it to completion at the day of Jesus Christ. It is right for me to feel this way about you all, because I hold you in my heart, for you are all partakers with me of grace, both in my imprisonment and in the defense and confirmation of the gospel. 1 Thessalonians 2:19-20 ESV For what is our hope or joy or crown of boasting before our Lord Jesus at his coming? Is it not you? For you are our glory and joy. Philemon 1:7 ESV For I have derived much joy and comfort from your love, my brother, because the hearts of the saints have been refreshed through you. REFLECT: Would it help for you to paraphrase these biblical words into your expressions of encouragement and prayer this week? LIFE GIVING LEADERS SEE PEOPLE AS GOD SEES THEM — AND IT LEAKS OUT SO OTHERS SEE AS WELL. Leaders: Are we living in a ‘kairos’ moment? IS THIS A ‘KAIROS’ MOMENT FOR THE CHURCH IN THE UNITED STATES? Answer: Kairos is an ancient Greek word meaning the right or opportune moment (the supreme moment). In the New Testament kairos means “the appointed time in the purpose of God”, the time when God acts (e.g. Mark 1.15, the kairos is fulfilled). To be more personal, is this a ‘kairos’ moment for me and Columbia International University http://www.ciu.edu , the ministry where I currently live out my service to Christ? I will attempt to define why I think it might be a ‘karios’ moment. I will then describe my initial thoughts on how to respond. CIU started in 1923 as part of the Bible College movement of the early 20th century. Under the son of the founder, Robertson McQuilkin, president from 1968 to 1990, the values of the school were distilled and clarified. They remain vital to understanding CIU and since I have been a part of CIU twice in my own journey, 1977-1983 as student and staff, and since 1997 as faculty member and director of alumni I have adopted them as my personal foundational values. It is beyond the scope of this article to go in depth on the five values. But it critical to observe that the Bible (value #1) and the work of the Holy Spirit in every Christian (value #2) are foundational to how we will approach knowing Christ and making him known. Prayer & Faith (value #4) and Evangelical Unity (value #5) describe how we will relate to God and other Christians as we live out our mission. But World Evangelization (value #3) is different from the other four. It is not our foundational starting point or the guiding parameters on how we relate. It is our mission; our reason for existing as a school. We would say it is THE theme, mission and purpose of God’s activity in the world. He is the God who sends. Every Christian is a sent one, all called to join him in his mission. The other four values all support or enable the mission. We report for duty with God’s truth (The Bible) being empowered by his Spirit to walk in dependent trust expressed in constant conversation with God and seeing God’s children as our brothers and sisters of his one family. Our duty is to take the message of the God who loves and shows that love in the saving work of Christ to every people group on the planet. CIU is on a mission to train students from a biblical worldview to impact the nations with the message of Christ. And that is my personal mission! I seek to evaluate, surely not perfectly, but consistently, every investment of my time and money in accomplishing this mission. With that glimpse into who we are let me now describe two of the factors that I believe that have swept us into a “perfect storm” or a ‘karios’ moment. 1. A large part of the evangelical church is redefining God’s mission as loving compassionate engagement in acts of mercy and justice. Compassionate service is equal to a message to be delivered. I heard a professor from another school say, “We used to have at least 25 students every year wanting to major in Evangelism, Discipleship and Church Planting. Now we are lucky if five show up.” They are opting for community health and other training for compassion ministry. Now I know that the battle is raging between those labeled “priortists” and “holistic” and I won’t wade into that debate here except to say I fear the church is repeating the tragic course of action that occurred in the early decades of the 20th century which led to a split of the church into what were called “liberal” and “fundamentalist”. The current evangelical movement grew out of the fundamentalist church and now is splintering into similar camps with different labels and somewhat nuanced beliefs. 2. There is also a contribution of the storm that centers on who is saved and how God saves I would call creeping universalism. This cuts the heart out of missions as it paints a picture of a tolerant God who acts beyond the choices of the people he created in his image with the capacity for responsible choice to save all people. Why should our brightest and best go to the unreached if God has a plan to save them that is separate from them hearing and placing faith in the Gospel? Why endure rejection and possible persecution to carry a message if God saves those who never hear? There are other factors in the storm that I feel are diverting the focus and resources going into God’s mission. But even these two are enough to see that CIU and schools like it may be attempting to recruit students to training for a mission that the leaders of their churches no longer value. Will we be blown away in the storm? Will we rise to fight another day? I hear from some of these younger leaders that the words “missions” and “Great Commission” communicate dusty outdated images and should be retired. I have never been one to fight for words and know that words move and shift in meaning and usage. Just think of “cougars” and “gay” as examples. But what about the content these words carry that shorthand’s the vision and activities of God’s people being on mission? Surely if God is on the move from Genesis to Revelation to fill the earth with his glory by bringing people from death to life in Christ that has not become out dated and to be erased. What are the “hot” words that describe the church and every Christian aligning with God’s Spirit in taking the truth of John 3:16 to all peoples? Has the US church 21st century attempt to update led to pursuing a different mission than the one instituted by God? At the start of the 20th century books were written, organizations and denominations started and schools were launched as expressions of repentance to live in pursuit of God’s mission. A century later we are at ‘kairos’ moment how should current leaders respond? 1. Small nice little plans and goals won’t work in a hurricane level storm. Leaders must step up and join the boat builders, giant killers, and journey takers in Hebrews 11. 2. There must be a disciplined spirit of endurance. Infused with biblical hope there will be clarity and a refusing to step aside, stop or be sidetracked much like our Lord’s faithful walk to the cross. 3. All actions must be done in Spirit energized love. A love that sacrifices, gives to, blesses and is willing to engage in more than just a battle of words. The Gospel is a message of God’s reconciling love and his church must model that reconciling love. That calls out humility in leaders that lays down life for the lost and even for a church that is in danger of losing its vision and way. Where believers must separate to remain faithful to God it must be accompanied by tears not hurling stones. Before I began writing I was praying through the Lord’s Prayer. The Spirit stopped my heart at the second clause – “may your will be done on earth as it is in heaven”. As I prayed over that phrase I was reminded that every Christian stands inside 3 concentric circles. Innermost is my circle of responsibility FOR…. I am responsible before God for my actions, words and attitudes. Only my choice, granted me by God, blocks these actions of obedinece taking place. The second circle is my circle of responsible TO… I can influence and have direct contact. I can influence my spouse, children, etc., by loving them. I cannot be responsible FOR them but God holds me accountable TO them. The outer circle is my responsibilty TO that I cannot directly contact but can influence through prayer. Is God’s will centered on the Gospel bearing fruit among all people groups? 1)	RIGHT NOW and in every present moment I can seek God’s will to be done in me; in the range of the reach of my body. Are my priorities, goals, and desires aligned with His mission? 2)	I can seek God for the grace to be aligned with his actions with the people he allows me to touch. 3)	I remember being in a prayer group several times in the late 1970s and early 80s praying for open doors for the Gospel to spread in what our maps labeled as the Soviet Union and China. With other Christians we offered thanks to God as the “Iron Curtain” crumbled into a rust heap and waves of the Gospel broke through. I remember celebrating President’s Nixon visit to China as a first step in God answering those prayers. There are millions of Chinese I have never met but it is incredible to think that my weak prayers joined with a chorus of others and became a part of God’s work of growing a harvest of souls in the underground church in China. Do you think it might be a ‘kairos’ moment in our day? What direction should the leaders of schools like CIU, churches, and mission agencies take in the storm? I serve as director of alumni for Columbia Intl University. www.ciu.edu . One day a month we cancel classes to devote more time to prayer. John Heflick worked with alumni volunteers Laslene Glymph and Yvonne Fredrick along with faculty, students and alumni to produce a prayer guide to use on a recent day of prayer. I have already benefited from using this resource in my own prayer times. There are many creative ways you could draw from this for the prayer ministry of any ministry, mission or church. Post comments and reactions here!